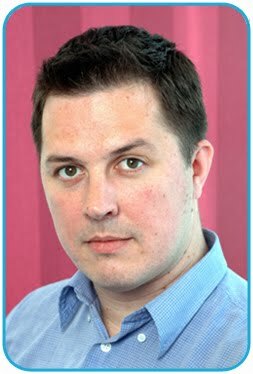 I have previously written about consumers using the internet at the same time as watching TV – with notable examples coming from Diamond Geezer on Dragons Den or live blogging around the Apprentice. The Ofcom data shows that up to 36% of viewers are consuming the internet whilst watching TV and that this is most prominent amongst younger audiences (who are also regularly using their mobiles during TV viewing.) 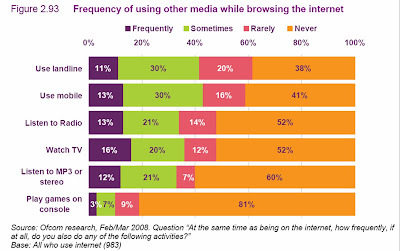 TV viewing is also popular whilst surfing the internet with more people frequently watching TV whilst online than consuming anything else. 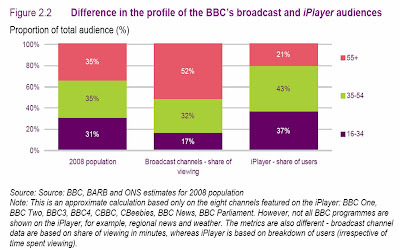 The Ofcom report contains charts about the BBC iPlayer that show the differences in programmes watched on BBC TV vs the BBC iPlayer and differences in audience between BBC TV and BBC iPlayer. 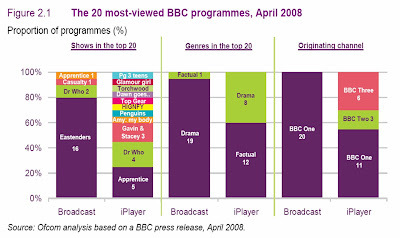 The difference in audience between BBC1 and BBC iPlayer are demonstrated by the Ofcom chart below, where there is a big difference between the proportion of 16-34 year olds consuming BBC content through the iPlayer rather than on BBC1. The above statistics demonstrate how internet usage is impacting on media consumption and shows that it is now impossible to consider one media channel in isolation. Viewers will search online for information about a TV programme or respond online to TV advertising whilst they watch and it is important to take account of this when producing marketing / media plans. 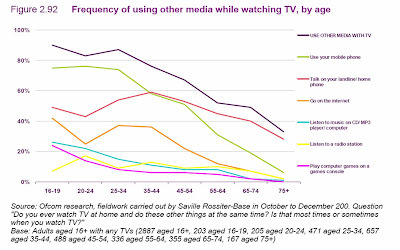 The Ofcom statistics also show the different audience behaviours by age group and highlight the differing media usage of young people in the UK (highlighted by the fact that 16-24 year olds who have broadband in their homes claim that they would miss the internet (47%) more than they would miss the TV (41%)). The Ofcom Communications Market Report 2008 gives an interesting insight into communications in the UK. The report gives details on the advertising market, media consumption across a range of channels and a wide range of market statistics including broadband penetration, mobile usage and environmental issues. Key points can be found here or the full Ofcom Communications Market Report can be accessed here. 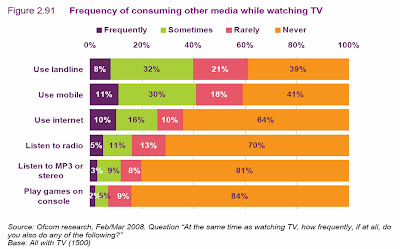 It certainly ties in with previous research into multi-device households, and increasing multitasking. I suspect the averages will vary wildly from reality for television - certain events will inspire a lot of interest and live blogging/microblogging etc. Other times it will be minimal because there's nothing worthy of discussion. I agree that it will vary around different events. There was a big uplift in iPlayer traffic the day after the Apprentice clashed with the Chelsea v Man Utd Champions League final and I think this will continue - however it doesn't seem to be slowing uptake of recording devices. Also NBC are seeing amazing results for their online Olympic streaming and I suspect there will be some interesting figures for BBC internet Olympic coverage too.